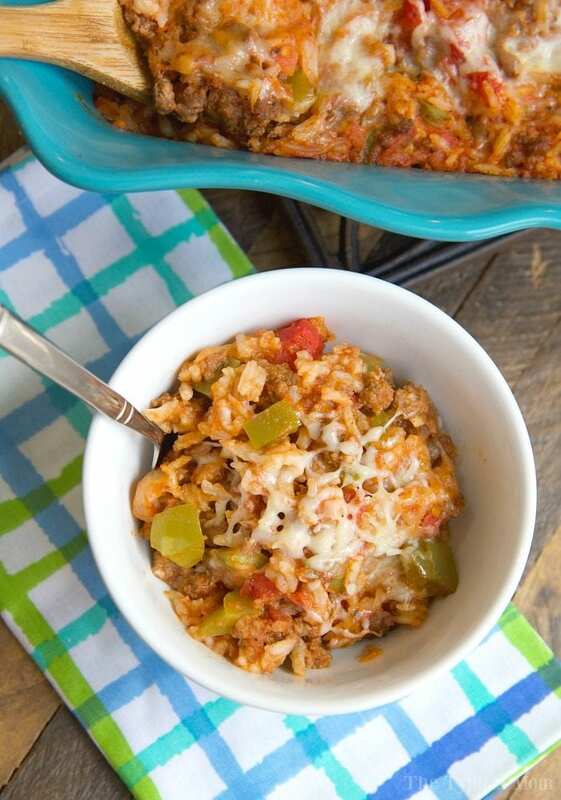 This cheesy stuffed pepper casserole is a family favorite for sure! 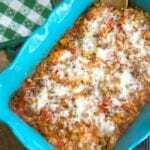 Like unstuffed bell peppers it’s an easy casserole topped with lots of cheese you can throw together and even my kids love it! Packed with the classic flavors you remember it is easier to make and great the next day too. When I married my husband he taught me how to make “his Grandma’s stuffed peppers” because he loved them so much. We all really liked them and it even got my daughters to really like bell peppers because of it. I still make them quite often but because I was on a casserole kick this month I thought I should be able to create a sort of deconstructed bell pepper recipe in the form of a casserole….and here it is!! It worked really well and I basically used the same ingredients in my original recipe to make it (with a few minor adjustments). Like I said, everyone prefers a different level of seasoning and spice levels so adjust as you see fit before pouring it into your casserole dish to see if you want more, but this was perfect for our taste buds! This is such a great recipe in fact it was featured by Country Living online with several other of their favorite dishes! In the video above I added tomato sauce, in the instructions below I swapped out for spaghetti sauce because it added even more flavor. You can use either one but after a time or two we prefer spaghetti sauce if we have it on hand. If you have a pressure cooker we also made this Instant Pot pepper casserole you can try, there we did not precook the rice. You basically precook everything but it all comes together when you pour it into your casserole dish and pop it in the oven. Everything melds together and the flavors really come out then. Serve as is or with a side of salad or bread and you’re done! 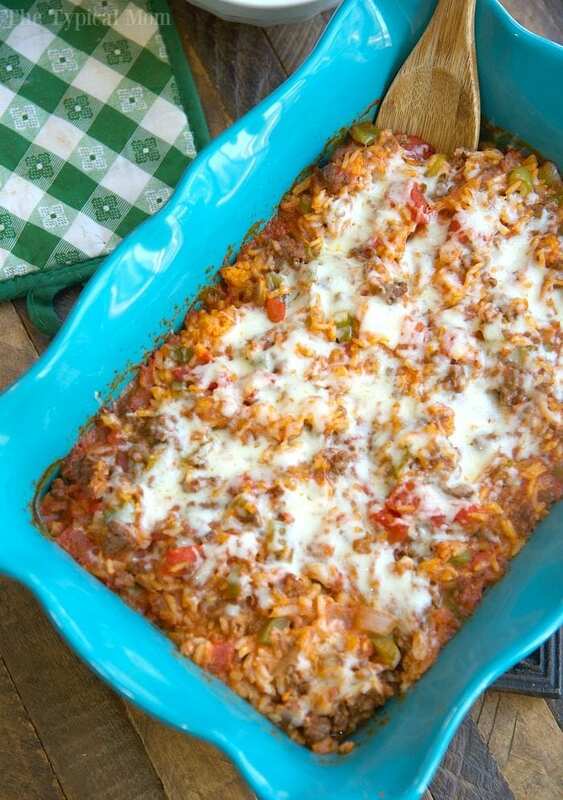 This cheesy stuffed pepper casserole is a family favorite for sure! Like deconstructed stuffed bell peppers it's an easy casserole topped with lots of cheese you can throw together and even my kids love it! Packed with the classic flavors you remember it is easier to make and great the next day too. Put olive oil in a pot on medium heat. Add ground beef and brown, add diced green peppers and onions and simmer until they soften a bit. Add all other ingredients except the rice and cheese. Simmer everything for about 5 minutes until it reaches a slow boil. Turn heat off and stir in 1 cup of your cheese and your cooked rice. Spray a 9x12" dish with non stick spray and spoon mixture in. Put in oven at 350 degrees for 30 minutes. Then top with last cup of cheese and put back in for 5 minutes. Serve! Very good recipe….. but I would advice cutting down on the salt. 1 tsb salt, 1 tbls Seasoning Salt, 1 tsb Garlic Salt makes it too salty. Dude or Dudette, read the recipe. This recipe is absolutely wonderful! Thank you so much for sharing it! your recipe calls for 2c rice. but you only use one? Have you ever sliced the green bell pepper and layer the bottom and/or top of the casserole with the slices? Or do you think it would mess it up. I was just wondering because I kinda like the way the bell peppers skin is after baking. Of course you might have to use more peppers. No I haven’t. You could but they wouldn’t be as soft as dicing them up and cooking for a bit to soften them up at the beginning but totally up to you! I would like to make this as a freezer meal for my sister who will be bringing home a new baby girl this month. Do you think it would freeze well? Should I bake it then freeze or freeze before baking? I haven’t frozen it before. May make and portion into smaller containers, enough for 1 meal and freeze and then bring over. Do you cook the rice first before you add it it or add it in uncooked? Regular size, 14 oz. or so. This is so much easier than the traditional dish!! Stuffed peppers made easier? Yes please!